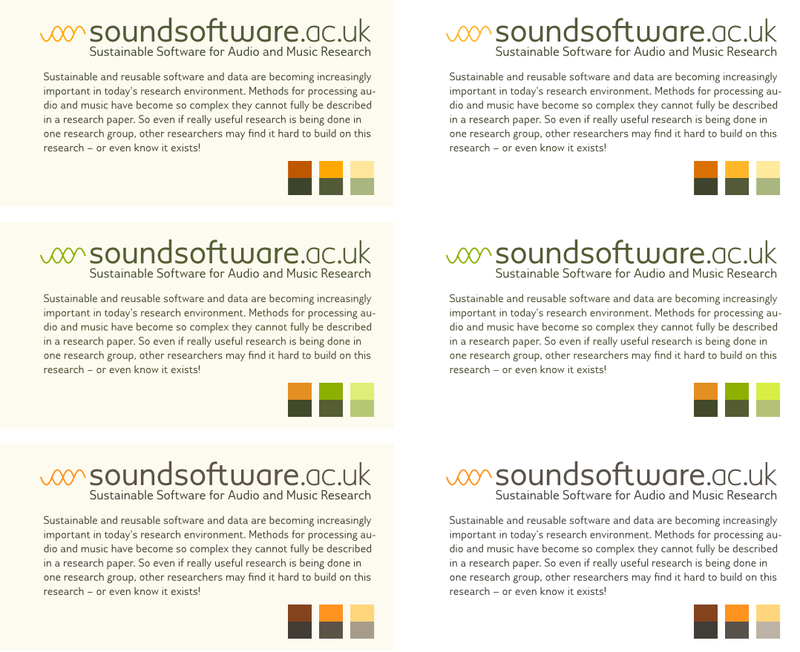 Soundsoftware is an initiative to further the sustainable development and (re)use of software and data in the audio and music research community. I was hired to create the logo and in the process I also defined a color scheme and helped with choosing a default font (Gillius ADF No2). Design of a either a logotype, or a symbol and logotype combination, for the Soundsoftware project. 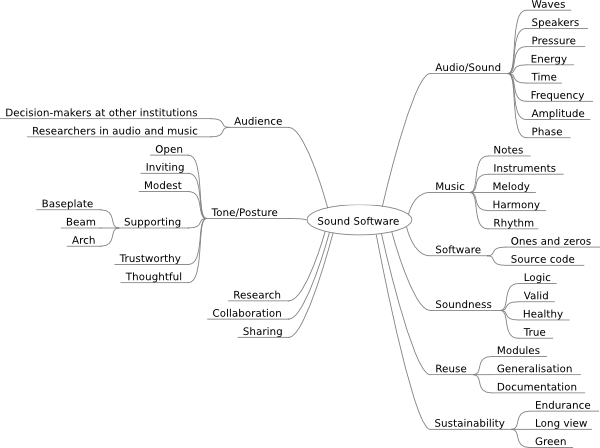 The artwork has to be in line with and ideally support the goal and strategy of the project: To encourage and further sustainability and reuse of software in audio and music research. To this end, the project will reach out to other institutions and will take part in events. We chose a shade of orange to be warm and energetic, but not agressive. The green doesn’t take away from the warmth and is associated with sustainability (environment protection) and reuse (recycling). I often start with very rough notes and sketches on paper, but this time I created this mind-map, using FreeMind. Last set of color variations. The thing I found most interesting about the process was the way that Thorsten’s work clarified the perceptions that we had about the purpose of the project itself. This is partly through dialogue (he asks me what the project is about and who it’s for, and so I have to find a sensible answer) but also through the experience of having someone accurately interpret the things you say and make them concrete. There’s an interesting sense in which, when working through his proposals, I’m also having to sift through the ideas that we have come up with about the purpose of our project, and decide which ones are most meaningful to us. Perhaps this is just the way things ought to work with any designer, but it certainly isn’t always the case. When we finally settled on a design, it was both more minimal than anything we had experimentally produced in-house (we made a number of alternatives ourselves before deciding to call in an expert!) and more satisfying – there was a funny degree of holding up the design sheets and going: “Is this it? This is all there is to show for two weeks work?” – which is the best consequence, as we have something simple that gives the right first impression, bears scrutiny from pedantic geeks, and sits well in the layouts. Thanks to Chris Cannam for arranging this job and being a great client and representative of the initiative!